When it comes to island hopping destinations in Thailand, Krabi may be overshadowed by nearby Phuket island, but I think both are very scenic and worthwhile. Krabi has lots of islands, temples, and nice resorts to check out, and it can be reached easily from Phuket. 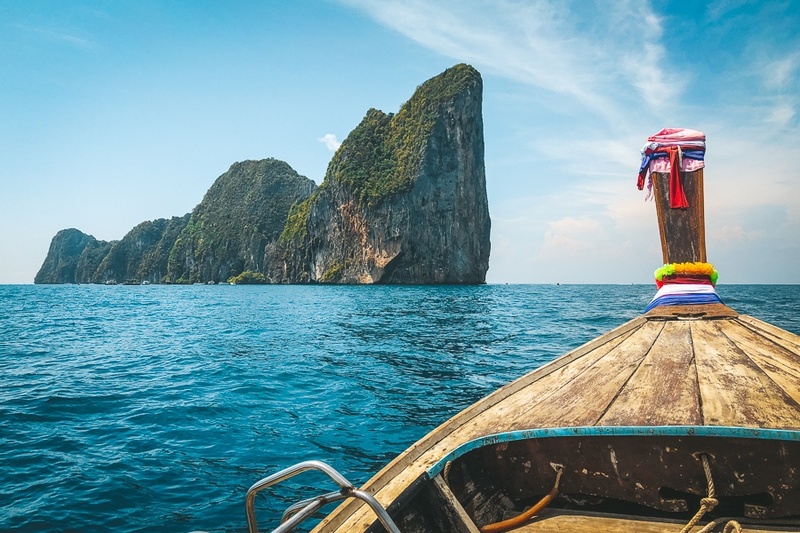 Here are 11 of the best things to do in Krabi! The most popular island tour from Krabi is the four islands tour. There are lots of companies selling this tour, and it can be a bit crowded at times, but the incredible island views are worth it. The four main islands you will visit on this tour are Koh Poda, Koh Gai, Koh Tub and Koh Mor. They each have their own unique features, and they’re each amazing. Technically, Koh Poda is part of the four islands tour, but this one gets its own separate mention because you can take one of the most famous photos in Thailand — the longtail boat with the vertical rock island in the background. The main beach at Poda has a long stretch of white sand, and if you follow it clockwise around the island then you’ll find some hidden spots that are less crowded. Railay Beach has it all: restaurants, resorts, spas, coffee shops, dive shops, rock climbing shops, and some incredible views. There are a bunch of high end luxury hotels at this beach, but if you’re on a budget then you can still visit Railay by taking a short boat trip from Krabi Town. Ao Phra Nang is one of the most epic beaches in Thailand, with huge rock towers on either end of the beach and a big limestone cave to explore on the south end. This one is definitely worth seeing. Phra Nang can be reached on a short 5 minute walk from East Railay Beach. Koh Lading is a cool island that can be reached as part of the Hong islands tour from Krabi. There’s an awesome natural bay in the front where the tour boats park, but if you take a short 5 minute walk you’ll arrive at a second beach with less people. The Phi Phi islands (Don and Leh) are two incredible scenic islands near Krabi that can be reached on a day tour, but it’s better to stay here for at least a few days of sightseeing before heading back to Krabi. The main island is Phi Phi Don and it has accommodation, restaurants, and more. You can rent a boat tour here to explore some more nearby islands and beaches, or just sit around in town and soak up WiFi at a cafe. This is a hidden bay on the north end of Phi Phi Don island that you can reach by kayak. Nui Bay is not a complete secret anymore, but the popular boat tours don’t go here and it’s still mostly unknown to tourists. The turquoise water here is incredible and it’s a great place for snorkeling. Phi Phi Leh is the sister island to Phi Phi Don, and it has some incredible spots. The most well known is Maya Bay, which is a hidden (but famous) white sand beach surrounded by huge limestone rock cliffs. Most boat tours to Maya Bay also stop at the similarly incredible Loh Sama Bay and then the Pileh Lagoon. The water all around this island is so clear and turquoise it looks like Listerine or something. Also known as Khao Phing Kan, this island is famous for the 65 foot tall rock sticking up in the bay. It’s also the film location of the 1970s James Bond movie, The Man with the Golden Gun. This natural island is just one of the many cool things to see in Phang Nga Bay, which is reachable from Krabi on a day trip. This is a white and black Buddhist temple in Krabi Town, with traditional Thai architecture and cool snake statues on the stairway leading up to it. There’s not a whole lot to see here, but it’s free to visit and definitely worthwhile if you happen to be in Krabi Town. It was easily walkable from my hotel in Krabi Town. Phuket is just a ferry trip away from Krabi, and it’s a big island with a wide variety of places to stay and things to do. It’s a good idea to spend at least a few days here, even if you plan to base yourself in Krabi. There are lots of nice beaches and restaurants in Phuket, as well as some traditional Thai temples and a bunch more islands to explore. You can even play with tigers!